Gallia Academy freshman Todd Elliot, left, hits full stride during the 2018 Skyline Bowling Invitational held Oct. 2 in Centenary, Ohio. IRONTON, Ohio — The Rock Hill boys and Fairland girls came away with top honors on Tuesday during the 2018 Ohio Valley Conference cross country championships held at Ironton High School in Lawrence County. The Redmen defeated the seven-team field by 27 points to claim the boys title, while the Lady Dragons were 13 points better than the four-team field in the girls event. Rock Hill posted a winning tally of 28 points in the boys contest, with Fairland placing second with 55 points. Ironton (102), Portsmouth (121) and Gallia Academy (125) rounded out the top five spots, while Coal Grove (152) and South Point (165) completed the final standings. Aiden Kammler of Portsmouth was the individual champion in the 61-competitor boys race, posting a winning time of 17:10.53. 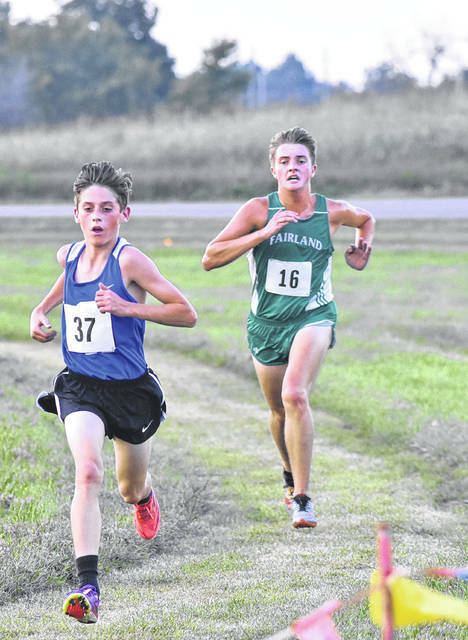 Ethan Miller of Fairland was the overall runner-up with a mark of 17:23.43. The Blue Devils — who had one athlete earn honorable mention all-league honors — were led by Todd Elliot with a 17th place time of 19:46.96. Chancey Odom (20:24.17) and Nicholas Sheets (21:18.51) were next with respective finishes of 24th and 31st, while Tristin Crisenbery (21:52.42) was 34th overall. Garytt Schwall (21:58.05) completed the team tally by finishing 35th. Ethan Lawler (22:30.94) and Ethan Saunders (23:50.01) also placed 39th and 45th for GAHS. Fairland won the girls championship with a final tally of 27 points, with Rock Hill coming in second with 40 points. Gallia Academy was third with 67 points, while Ironton rounded out the girls field in fourth with 92 points. McKenna Pannell of Fairland was the individual champion in the 42-competitor field with a winning mark of 20:23.34. Teammate Emma Marshall was the overall runner-up with a time of 20:24.19. The Blue Angels had two athletes earn all-league honors, one of which was a honorable mention selection. Sarah Watts led the Blue and White with a fourth place time of 21:24.15, while Brooke Hamilton was 17th overall with a mark of 26:04.23. Kristen Jamora (26:29.67) and Eliza Davies (26:34.97) were next with respective efforts of 19th and 20th, while Ines Perez (27:38.30) completed the team tally by finishing 23rd. Maddie Stewart (30:03.67) and Taylor Facemire (30:30.76) also placed 30th and 31st for the Blue Angels. Visit baumspage.com for complete results of the 2018 OVC Championships held at Ironton.